Breezy, humid, as I step out of the hotel lobby in the 15th arrondissement. Arriving last night, from across seven time zones, I know the lag won’t hit me till tomorrow. Ah, but a great cure, up early with the sun and a long walk on cobbled streets. Pied-à-terre. It’ll be quiet too with the hot August scattering Parisians out of the city. Not many tourists either, nice. Have to see the tower first. 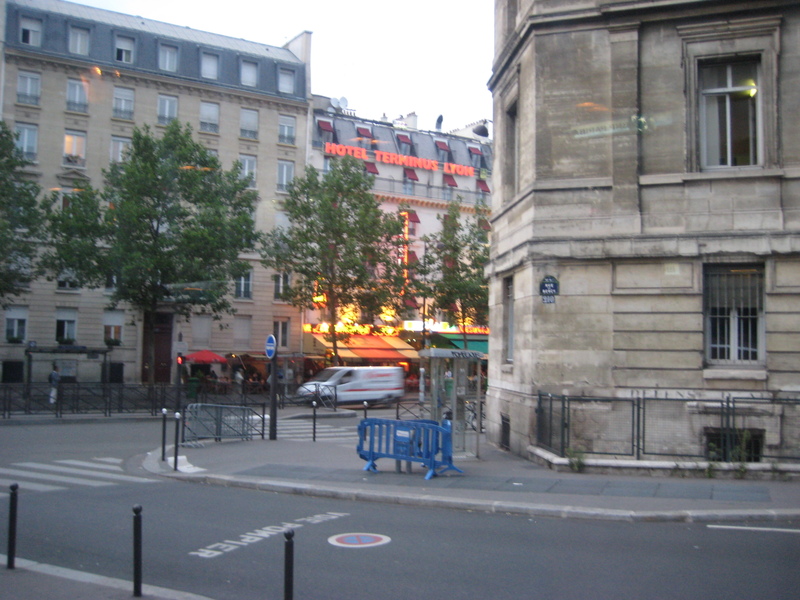 North on the rue de Vaugirard, the closest metro at Vaugirard and rue de la Convention. If you’re ever there at this corner, look up to the East. The building there, sharp, like a slice of French cake that’s decorated Louis XVI on one side and bastille brick on the other. Went down to the metro tunnel, only to buy a day-ticket, in case I go too far and get too tired to walk back. Back at street level I head north towards the tower. Love this old city as it conveys upon me a wanderlust. I’m continuously in awe of the architecture styles changing from block to block. Round every corner, a door, archway, alley that takes my breath away. Too maybe, it’s that warm, not-so-clandestine notion of history, the saga of these boulevards. Every visit I always find a place with the oldest cobblestones to stop, reach down, and feel the worn stone. 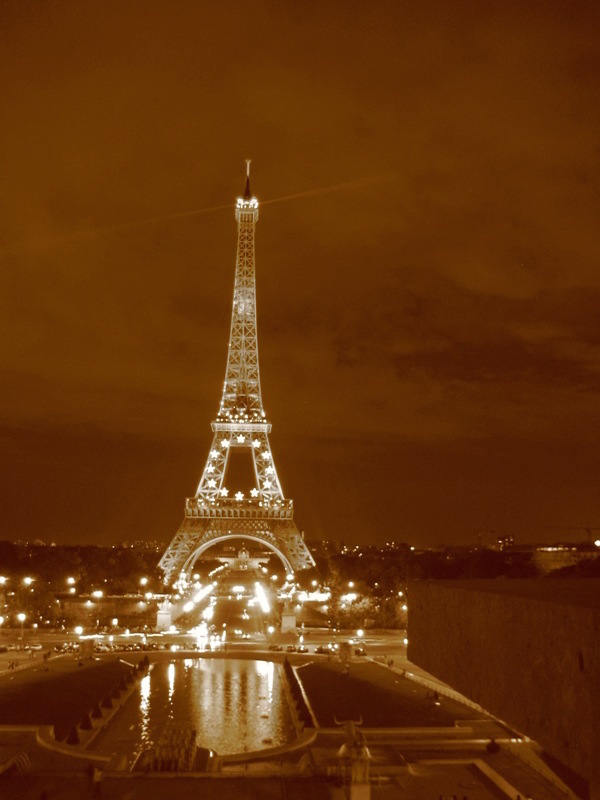 It makes tangible this unreal, city of love and light. There, the great ironwork reaching into the heavens. I’ve been here on days you couldn’t see the grass for so many lunching on the field; but today, the Champ de Mars is nearly deserted. I pause at the monument to Peace where, not lost on me is the irony that this structure stands across from a military school. 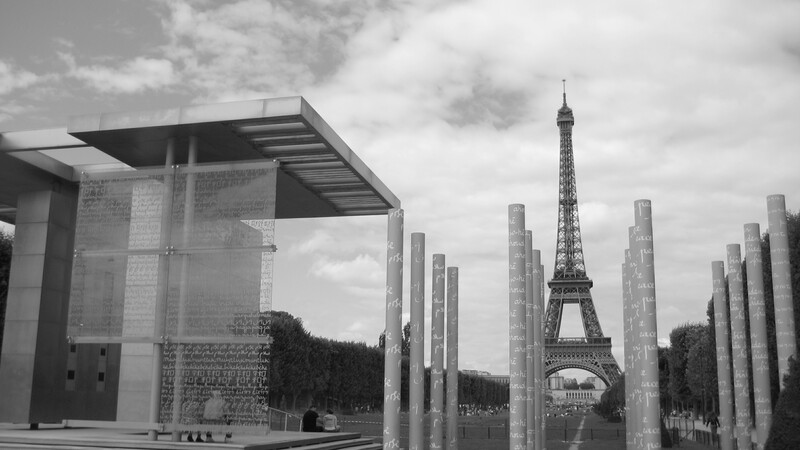 On to Eiffel’s tower. The wait for tickets and an elevator is short and soon I’m on the second floor sipping water, munching on a sandwich and looking out over the city. 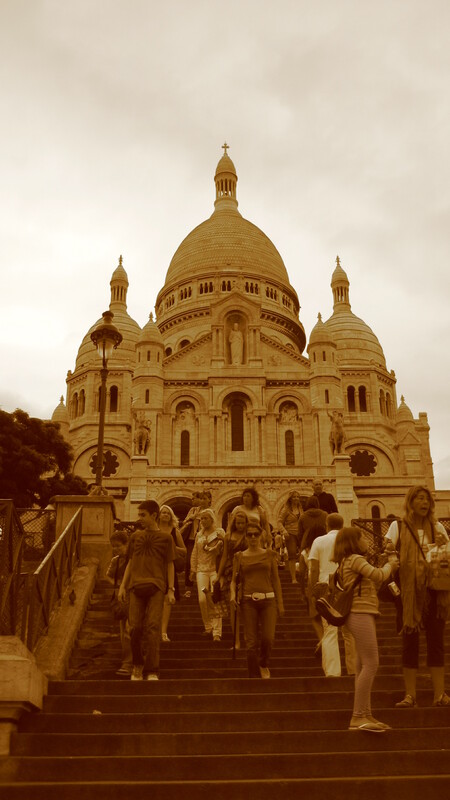 Ah, the white onion domes of Sacre Coeur. I have to go there. But being too far to walk, the Metro it is. Not busy in the Metro tubes either. Somehow the city, to me, in such a depleted state, gains a kind of ‘life without life’. Indeed it lives and breathes on its own as if it’d always been here, always existing. 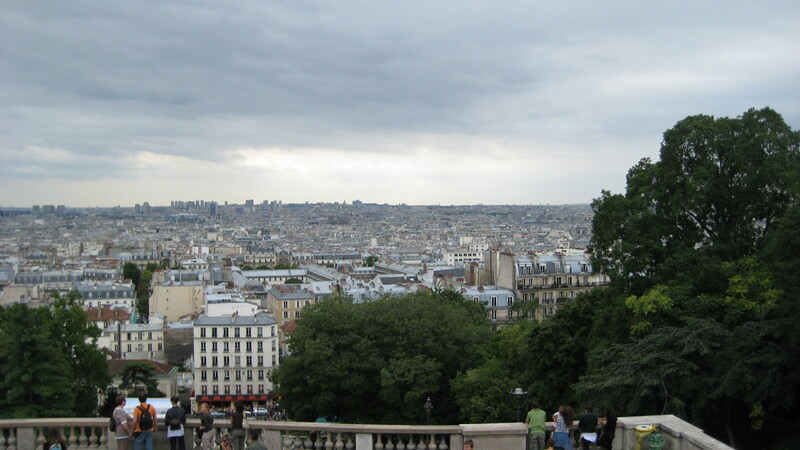 Montmartre, the old gypsum hill. To have been here when Van Gogh, Monet or even Dali or Picasso caroused these narrow streets. I go from shop to shop, not buying, but soaking in the atmosphere as even in August the rue de Steinkerque is abuzz. A turn of the corner and there, above, the dominating white basilica. I choose the climb over the tram, and with no pauses till the top! A good test of my old knees. The Basilica being closed to the public, I find a space on the steps, joining the others gazing over the expansive city below. Suppose, over the years, all the tourists, or perhaps faithful, sat here finding their own understanding of calm, contentedness or like me, solitude amidst the crowd. As with my wont, woe finds me and the light changes. I look into my bag for pen and paper, my tools, my prescription to change my mood. Turning to reach into my bag I see, a step above me and an arm’s-length away a man, stout, older, grayer than I. Red-rimmed eyes, a look of introspection and I know there is some form of grief there. “Are you okay?” As I say this I grimace to think I first should have asked if he spoke English. “Okay,” I say and was about to turn away. “This city says: come, find or fall in love, wonder, see history, be a part of something greater.” He broke off as a wave of emotion brought a flush to his unshaven cheeks. His blue shirt was clean, rumbled, rolled up at the sleeves. Brown trousers, worn, again clean, but nearly threadbare. This is a man who once depended on someone. He reached into an age-old leather satchel and pulled out a crinkled, sepia picture of a young couple standing on the pont Alexandre bridge. The woman in a seventies ankle length, flower patterned dress; the man, above the waist dressed in a tux, below knee-length shorts and loafers. Again he’s overwhelmed. My own strings plucked, I had to look away and blink off the tears. Found myself nodding. He raised his arms, hands palms up as if to say, “so, there is the truth.” We stared out at the city for a while, immersed in our own histories. I broke off first. We both grunted to get our aging bodies off the steps, heading down into the life of the city.